Model Mail is a mail system internal to the Enterprise Architect repository that allows users to send and receive mail messages. One of the important advantages that Model Mail has over other mail systems is that it is possible to embed hyperlinks to parts of the repository, allowing the recipient to click through to the diagrams, matrices, elements, Packages, reviews and more. Most initiatives are carried out by a team of people, and critical to their success is good communication. With a fully featured tool such as Enterprise Architect, it is typical for team members to perform a lot of their work inside the tool; having mail internal to the repository provides a lot of advantages. The Model Mail facility allows team members and others using Enterprise Architect to send and receive mail messages including hyperlinks to repository content. 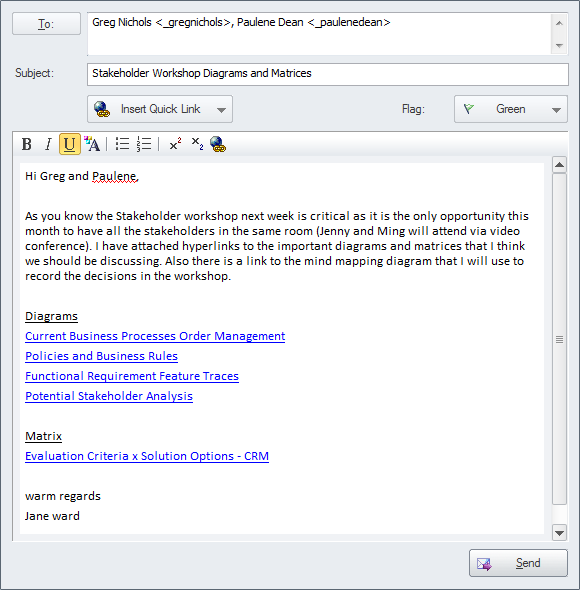 Model Mail can be used to send and receive mail messages internal to the model allowing team members and other stakeholders to communicate effectively about the model and its content. A typical scenario might be a team member sending a message with a link to a set of Requirements to a number of people asking for their comments. Model Mail has the option to insert links to a variety of repository items including: Diagrams, Matrices, Images, Searches, Help Topics, Attributes, Operations, Team Reviews and More.